Beamler provides users and manufacturers a plug and play cloud software solution for 3D printing. OVERFUNDING NOW TO €200K! Large manufacturers are transitioning from traditional manufacturing to new production techniques like 3D printing to improve the efficiency and costs of going to market. However, engineers often have trouble reaping the full benefits of 3D printing, as they lack the information and large outset capital requirements to efficiently transition to 3D printing. Beamler tackles both problems at once by offering a plug & play cloud-based software solution for 3D printing. Internet and technologies like 3D printing have made time to market a crucial global race. Despite an increasingly numbers of large manufacturers adopting 3D printing to reduce time to market, 68% of manufacturers experience implementation and operational issues. Beamler’s software helps larger companies to unlock the full potential of 3D printing technology by providing their engineers, product owners, and designers with up-to-date manufacturing data from a global network of machines. Beamler is cloud-based, which means designers and manufacturers can work together on the product while receiving real-time feedback. Receive the best production quotes. Beamler takes 10% commission on print jobs. Software has already been tested by 15.000 users. Willem-Jan studied Commercial Economics at the University of Applied Sciences in Amsterdam, The Netherlands. Before starting Beamler he founded two other start-ups in the 3D printing industry: Instrato and 3Dock. He plays field hockey at a high level. “I envision a world where anyone who has an idea for a thing or product can have it made and have it in his or her hands within an hour." Michiel holds a Masters in Communication Sciences from the University of Amsterdam. He has a decade of experience in online journalism, web development and project management. Roberto studied Biotechnology at the Van Hall Larenstein, University of Applied Sciences in Amsterdam. He studied Information Technology at the department of Computer Science at the VU University in Amsterdam, The Netherlands. Gabriele obtained his BA in Media and Graphic Design in Carrara, Italy, before moving to London to take the MA degree at the Royal College of Art. After working for GUM Design he co-founded the Smart Mobility Start-up Strappo. “I think in images, waking up everyday to deliver visual clarity and to design information." Mark has more then 10 years of experience working with web client technologies. Gregory studied at AMA University in Manila (Philippines) and worked at IBM as an IT Service Desk Analyst before joining Beamler. In his free time he is an avid gamer. Rijkje was country manager at Foodora before joining Beamler as a social media coordinator and campaign manager. Beamler B.V. is a limited liability company registered in the Netherlands under chamber of commerce number 66628059. The company is currently for 100% owned by Willem-Jan van Loon's management entity. At Beamler we have at the moment 7 FTE’s working for the company, five in Amsterdam and two in Manila (Philippines). In the short term we want to add three new people to the team: a sales engineer, a dealmaker and a developer. At Beamler we believe that people thrive when they are given the opportunity to do the things that suit their character, while giving them the room to develop new skills. Beamler built a platform that streamlines the additive manufacturing proces. It has several built-in tools for 3D model repair and model optimisation and the platform gives advice on material selection and connects to a global network of 3D print services. The platform is highly scalable: Increased usage will attract print services to join the network and the software becomes more powerful as more printers are added to the network. This in turn will drive usage. Q4 2017: account management and payment system; continued development on technical features. Beamler is a B-to-B company focusing on engineers and product developers that work for Tier 1 manufacturing companies. These companies are active in the automotive and medical industry. Despite significant growth, there is a wealth of untapped potential in 3D printing. In fact, 3D printing represents only 0,04% of the global manufacturing market, with prototyping as the leading use today. Wohler’s and Associates believes 3D printing will eventually capture 5% of the global manufacturing capacity, which would make 3D printing a $640 billion industry.” (Source: 3D printing: The Next Revolution in Industrial Manufacturing). We are currently in pilot projects with a large corporate with a revenue of €400 million and two SME's interested in our products and services. From our pilot project partner we received the following feedback: "Beamler is bringing knowledge and products in 3D printing to the table which we are lacking, so a partnership with Beamler would bring us better solutions implemented by people with always the most actual knowledge in 3D printing". Q4 2017: Close deals with strategic partners. Software that provides all information and advice needed to print your product in the best way. Global Network that gives access to all different types of printers around the world without the huge cost of ownership. With the Beamler software products get faster to market and engineers make less mistakes. This results in more turnover for a manufacturer in the same time of work. Beamler is currenlty running 2 pilot projects with customers. These pilots will be finished by the end of July. One of the pilots is a large corporation and the other one is a SME company. Beamler has also ongoing discussions with 5 potential customers in an advanced stage. We expected to have this quarter 2 other pilot projects which we will get started on. Direct sales by highly technical sales representatives. We see that going towards 3D Print exhibition is very important to get new leads. Also contacting directly by phone works very well. Many industries are interested in 3D printing. Our marketing strategy is to focus on automotive and medical industries use very specific channels to reach out to them e.g. blogs, journals and Linkedin. We want to invest €100.000 in sales and marketing in 2017. So currently Beamler is already actively going to exhibitions (sales) and making content for blogs and journals (marketing). When we close the new investment round we can rapidly increase the efforts into sales and marketing. Sales we do in house. Marketing we do partly with a third party. FABulous (http://fabulous-fi.eu/), The European 3D Print Accelerator. No revenues have been realized sofar in 2017, for 2016 minimal revenues were realized. In the other attachments you will find revenue development of the more optimistic scenario in the designated profit&loss account. The following assumptions apply to the worst case scenario. We have been granted one grant from the European Union of €178.000 as part of the Accelerator Program FABulous. An additional grant of €50.000 has been received from the Dutch government as part of the MIT program. Both grants were received in the sole proprietorship (Dutch: eenmanszaak) of Willem-Jan van Loon. All intellectual property rights have been transfered to Beamler B.V. upon incorporation of the entity. 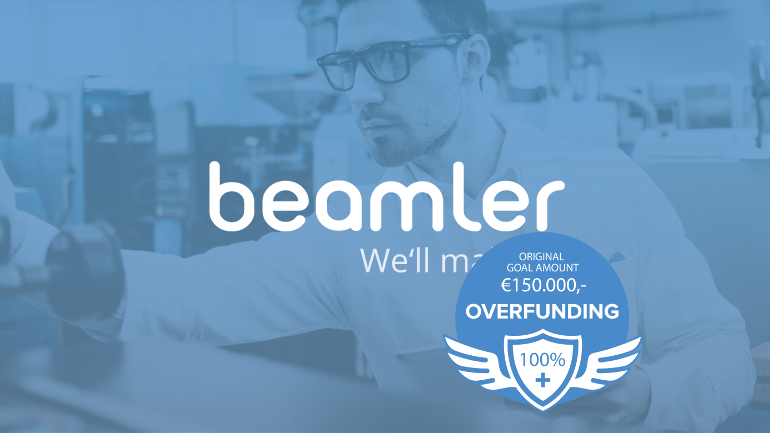 In 2016 we received a seed investment in Beamler B.V. totaling €40.000, while in 2017 we raised sofar an additional €52.000 in convertible loans from 6 business angels. We are having discussions with each individual investor on the terms of these convertible loan, with the intention to apply comparable conditions as this crowdfunding round. Our team team invested sofar more than €200.000 in unpaid hours and will not be expected to be remunerated for these unpaid hours going forward. These hours have been spend on market research, business case development and product development. For 2017 we have a funding requirement of €300.000, of which €52.000 has been realized already leaving a funding requirement of €248.000. With this crowdfunding campaign we intend to raise at least €150.000 as a minimum amount and a maximum amount of €250.000. The initial term or renewed term of the Agreement between lenders and Beamler B.V. expires within a month. 30% discount if the conversion occurs after 18 months. In the financial documentation we have provided a worst case scenario where we will be aiming for a sustainable business case without additional funding. However if we will not be able to reach milestones set in this worst case scenario we might require additional funding. In the other attachments we have provided a more optimistic scenario which provides for an additional funding round of at least with a VC in the future. In case our growth is higher than expected we will require potentially more rounds of funding. These funding rounds will provide the investors in this convertible note the opportunity to convert to shares of Beamler, but can also cause future dilution of the shareholding of investors. In case of a future down round there is an anti-dilution protection for investors who converted to shares in place. Buy out from a company that is active in the industry. Most likely this could be a company such as Autodesk, Adobe or Microsoft. We are in contact with them and we see that they have funding available to invest in 3D Printing. Beamler will do financially well and is able to make an offer towards the investors to buy the shares back at a premium. However, we cannot provide any guarantees one of these scenario's will be realized. 3D Print services communicating slowly, because most don’t use a CRM solution or don’t have an API connection. This takes extra days for the 3D model to arrive at the customer. The protection of intellectual property of the design is important for large corporations when they use the Beamler netwerk. Our head developer is based in Manila, because of time difference we have challenges to overcome in communication. Beamler currently doesn’t have a sales engineer and a dealmaker. We have seen in sales meetings that we are short in materials/machine knowledge (sales engineer) and how to close a deal at are large corporation (dealmaker). Competition: This year large multinationals such as Siemens, GE and SAP are entering the market with material, machine and software solutions. The software solutions have some similarities with our software. Financial assumptions: due to this increased competition or slower growth of the market we cannot provide guarantuees we will be able to realize our assumptions. The Lender agrees that its claims against the Borrower under this convertible loan agreement rank below all other, non-subordinated, claims against the Lender as referred to in Section 3:277.2 Dutch Civil Code (‘BW’). Lender issues a (subordinated) convertible loan to convert at a later stage to depository receipts to become a shareholder of the company. Lender expects an (exponential) growth of value of the company with the possibility to sell the depository receipts with a capital gain. However in most situations such capital gains do take more than an additional five years after conversion to be realized. In exchange for the possibility of a high return in case of a scenario of exponential growth of the value of the company, there is a risk the investment will be lost in case the company is not doing well. Please read here carefully the risks while investing in shares or loans offered by the companies published on Symbid. Here you can also obtain insight in the default report of Symbid before deciding to invest.